President Obama used India's Republic Day to big up US businesses. A UK prime minister should be next on Modi's invite list, says Cobra Beer founder Lord Karan Bilimoria. 65 years ago this week, after three years of debate, the constitution of a newly-independent India came into force. The document, which runs to nearly 450 articles in 25 sections, replaced the Government of India Act penned during Britain’s colonial occupation. With it was created the largest republic in human history. Every Republic Day, India's president and prime minister are joined by a head of state, who is received as the guest of honour. This week Barack Obama was the first US president to attend the festivities since their inception. Joined on his trip by a phalanx of prominent US business leaders — including PepsiCo chair Indra Nooyi and Mastercard president Ajay Banga — Obama seized the opportunity to cement America’s business ties with India. So it should be a matter of concern to us all that it has now been more than two decades since a Republic Day invitation landed on the desk of a British prime minister - John Major back in 1993. Prime Minister Narendra Modi has been travelling extensively around the world since his landslide election victory last year, but has not yet been to the UK. In fact, it is now eight years since an Indian prime minister made an official visit here. Since his decisive election win last year, Prime Minister Modi has busied himself with slashing away at the regulation that has stymied India’s economy for decades. He has also introduced a raft of excellent measures, including ‘Make In India’ to encourage domestic manufacturing. If he is successful, growth will be explosive over the coming years. Britain, meanwhile, despite the best efforts of UK Trade and Investment and the UK India Business Council (of which I am proud to be the founding chairman), still exports more to Sweden - a nation of fewer than 10 million people - than India - a country that is home to more than one in six of the world’s population. While some may put this down to post-recessionary woes, that certainly hasn’t stopped Germany, whose exports to India are more than double the UK's, or even Switzerland, where they are more than triple. Republic Day is an occasion for India to celebrate its independence from Britain, but it should also be an opportunity to remember how much history our two nations share. From cricket to curry and, if I dare say so, Cobra beer, the cultural exchange that our two nations have undergone runs deep - and this presents great opportunities for our future. We cannot underestimate the appetite there still is for British investment in the rapidly transforming Indian republic, because of these deeply embedded cultural ties. British universities are the best in the world, along with the US, and they attract students from across the globe, with Indian students making up the second-largest cohort. Indeed, I was not the first in my family to study at a British university – both my mother and grandfather did. And today I am proud to be the first Indian-born chancellor of an English Russell Group university, the University of Birmingham. It is this generations-long relationship that allowed me to come to these shores and build Cobra into a successful business. In a speech earlier this year, Modi said the Indian diaspora was ‘great capital’ for the nation and for spreading ‘Brand India’ throughout the world. That is no understatement. In fact, the Indian community in Britain is the largest ethnic community in the country and the most successful by far, reaching the top in every field - including business. And the links go deeper: more than half of the Indian companies with a presence in the EU are based here in the UK. For British entrepreneurs these connections present a unique opportunity to expand their businesses into the world’s second largest domestic market. If they seize that opportunity, hopefully within a few years it will be our prime minister (whoever they are) standing next to Mr Modi at the Republic Day parade. 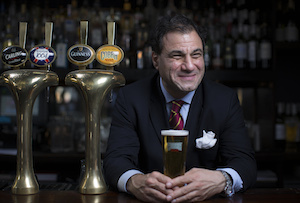 Lord Karan Bilimoria is founder of Cobra Beer and founding chairman of the UK-India Business Council.